Arthropods first appear in the fossil record some 530 million years ago. These joint-legged animals are the most species-rich and diverse animal group on Earth. The familiar creatures are virtually ubiquitous: horseshoe crabs, scorpions, spiders, ticks, millipedes and centipedes, crabs, lobsters, pill bugs, butterflies, ants, mosquitos, beetles, and the list goes on. Note the many body segments of this modern arthropod. Arthropods’ unparalleled success is in large part because of the segmented construction of their bodies and limbs. Evolution can separately modify each segment for different purposes, allowing arthropods to adapt to almost every possible environment and mode of life. Modern arthropod limbs in their most basic form have two branches, each of which is often highly specialized for one function – for instance, moving around, sensing the environment, breathing or mating. One of the major questions for paleontologists is how these double-branched limbs evolved. Our research recently published in Nature focuses on newly discovered fossils of a long-extinct group, the anomalocaridids, to fill in some of the evolutionary story for arthropods. Anomalocaridids first appeared some 530 million years ago, during a geologic period called the Cambrian. The most recent known anomalocaridids date back some 480 million years, and lived during the Ordovician period. To our eyes, these animals look very alien: they have a head with a pair of spiny grasping appendages and a circular mouth surrounded by toothed plates. Their long, segmented bodies carry flaps that were used for swimming. For decades, the true nature of these animals eluded us, with isolated parts being described as separate animals: their spiny head appendages were believed to be the body of a shrimp, the toothed mouth was considered to represent a jellyfish, and their complete bodies were described as sea cucumbers! It was only in 1985, almost a century after the first anomalocaridid fossils were discovered, that my co-author Derek Briggs together with the late Harry Whittington quite literally put all the pieces together and presented the first accurate reconstructions. Nevertheless, anomalocaridids remained enigmatic. 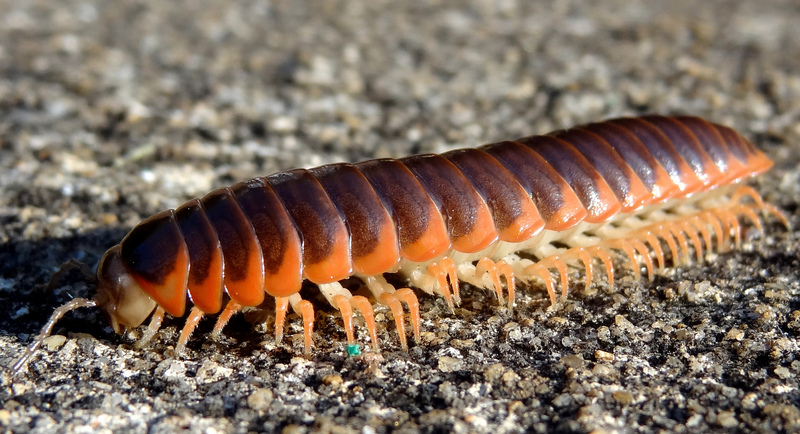 It would take almost another decade before they were finally recognized as arthropods. Even then, many questions about their anatomy and place in evolution remained. One mystery concerned the nature of the flaps on their bodies: it was believed that anomalocaridids possessed only one set of flaps, and it wasn’t clear to what structure in other arthropods these flaps were equivalent. Another mystery revolved around the apparent complete absence of limbs on their trunk – rather embarrassing for an arthropod! It was generally accepted that, as a result of their swimming lifestyle, anomalocaridids had completely lost their trunk limbs during the course of evolution. Lateral view of a complete specimen of Aegirocassis benmoulae. Note the presence of two sets of lateral flaps, providing critical new insights into the origins of modern arthropod limbs. The recent discovery of exceptionally well preserved three-dimensional fossils of a giant new anomalocaridid tells a different story. Collectors found fossils of the animal – named Aegirocassis benmoulae in honor of its discoverer Mohamed ‘Ou Said’ Ben Moula – in 480 million year old Fezouata Shale deposits in south-eastern Morocco. Artist’s rendition of the giant filter-feeding anomalocaridid Aegirocassis benmoulae feeding on a plankton cloud. Nowadays the area’s a rocky desert in the Sahara. But when the animal was alive, this area was located close to the South Pole and covered by an ocean. When the animals died, they sank to the sea floor, where their bodies were covered by mud flows. Hard rocks quickly formed around them, shielding the fossils from later geologic upheavals and preserving them in exquisite detail. Over the millennia, fossils invariably break into smaller pieces that require reassembly in the lab after collection. Often, they’re still partially covered by the surrounding rock. To reveal their full splendor, they need to be carefully prepared, using everything ranging from hammers and chisels, various sizes of dedicated air powered tools to chip away the rock, down to minute needles and fine scalpels. In this case, preparation of all specimens required close to 1,000 hours. Dorsal view of a complete specimen of Aegirocassis benmoulae. During this cleaning process, I discovered that the Moroccan fossils in fact had not one, but two separate sets of flaps per segment. 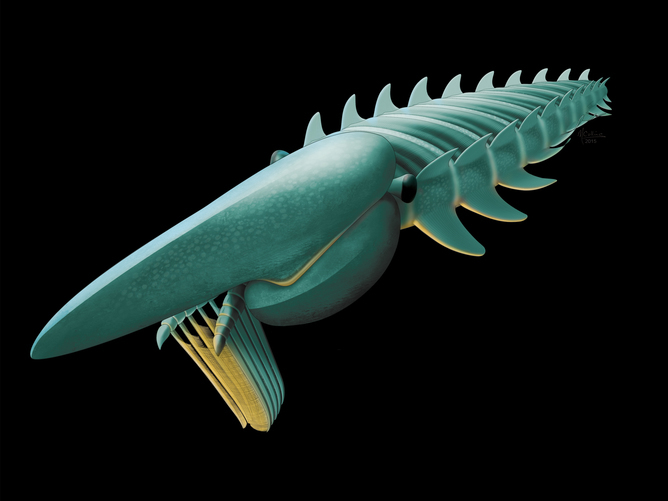 Together with my co-authors Allison Daley and Derek Briggs, we then re-examined other, even older anomalocaridids from the Burgess Shale in Canada. 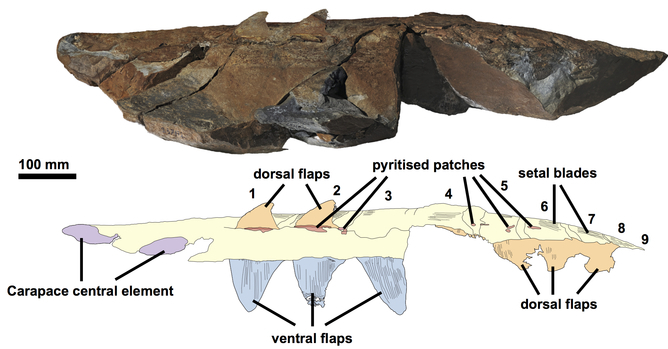 We found that a second set of flaps is also present in other species, but had been overlooked previously. The Moroccan fossils also revealed that ribbon-like structures on the back of the animal, which likely functioned as gills, were connected to the base of the upper flaps and suspended across the trunk. 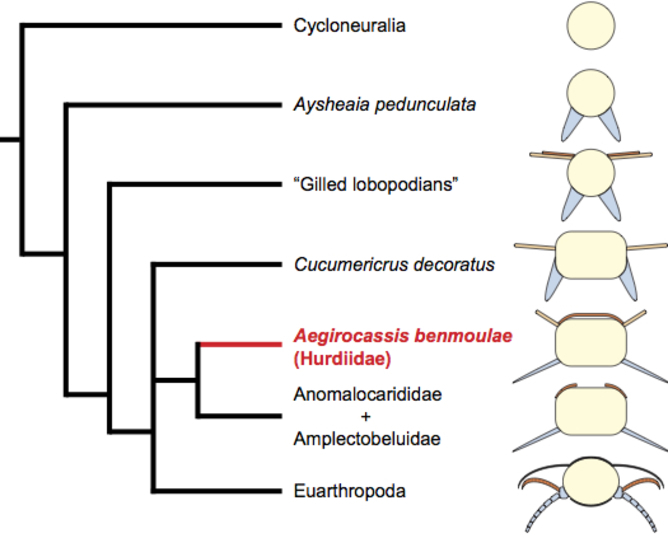 Relationships of major anomalocaridid groups that preceded modern arthropods. Cross-sections through the bodies show the morphological transitions leading to the double-branched arthropod limb. So anomalocaridids did not lose their trunk limbs, as had previously been thought. Rather, their upper flaps are equivalent to the upper branch of the limbs of later arthropods, while their lower flaps correspond to the lower branch and represent modified legs, adapted for swimming. 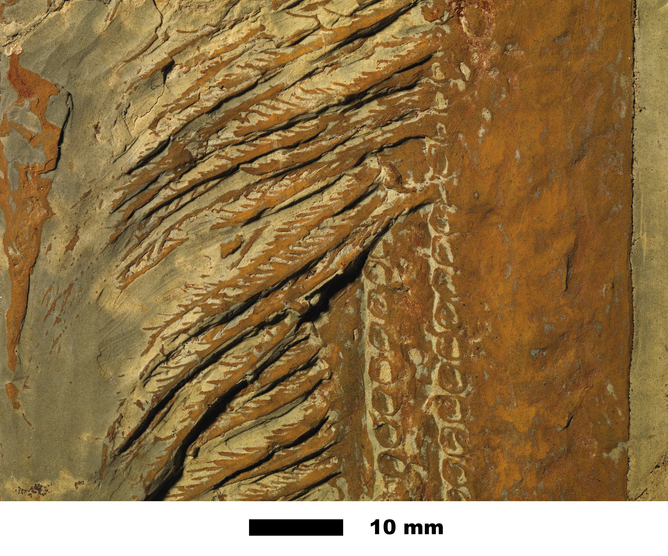 The fact that these structures are still separate in anomalocaridids indicates that classical branched arthropod limbs only arose later, through the fusion of both structures. This confirms that anomalocaridids represent a very early stage in arthropod evolution, before arthropod limbs were all branched. Detail of the intricate filter-feeding apparatus of Aegirocassis benmoulae. 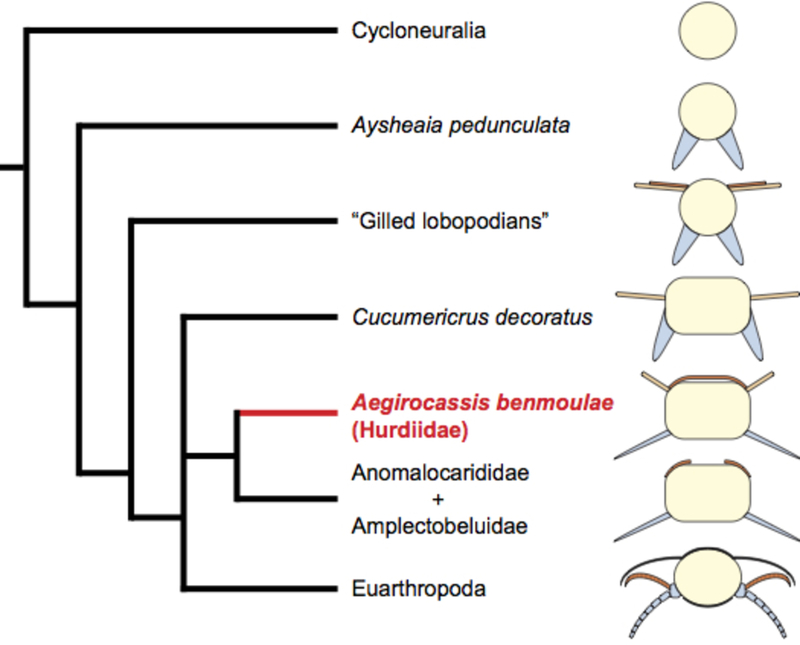 The discovery of Aegirocassis benmoulae is also significant from an ecologic point of view. Almost all other anomalocaridids were active beasts of prey which grabbed their quarry with their spiny head limbs. But the Moroccan animal’s head appendages are modified into a very intricate sieve, allowing it to filter plankton from the oceans. 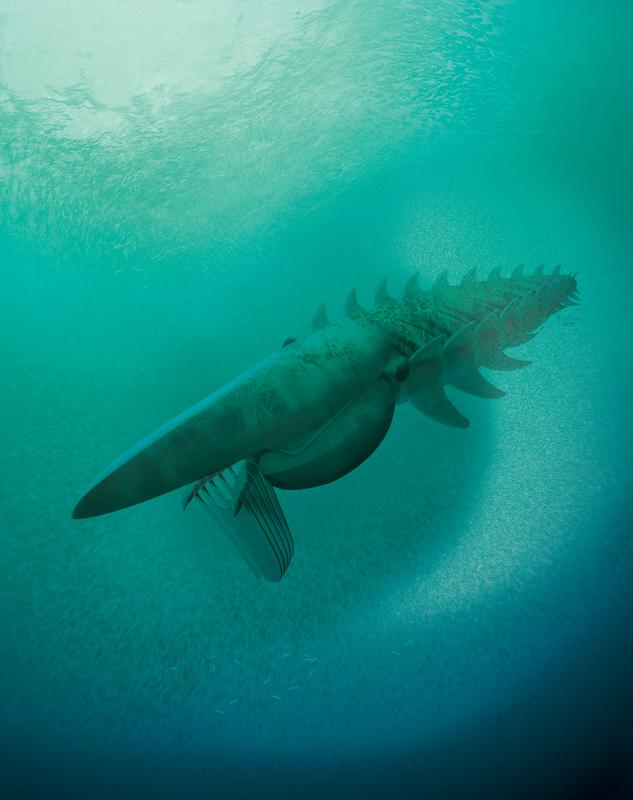 Aegirocassis benmoulae attained a massive size of at least up to 7 ft (2.1 m) in length, ranking it among the biggest arthropods to have ever lived. This giant evolved during the early phases of a massive increase in biological diversity, including in plankton. In this way, Aegirocassis benmoulae foreshadows the appearance under comparable conditions of giant filter-feeding sharks and whales in much more recent times. The Moroccan fossils provide by far the oldest example of massive plankton-eating animals evolving from active predators at the time of a large-scale increase in plankton diversity. They are a prime example of what seems to be an overarching evolutionary trend.